Waiting room offers a relaxing atmosphere. We know you have many choices when choosing a Dentist in Ventura , CA so we have made requesting an appointment a simple process via our Web site. If, for any reason you cannot keep a scheduled appointment, or will be delayed, please call us as soon as possible. We work hard with your insurance to maximize your benefits. 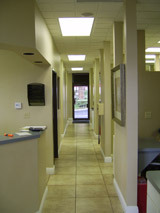 In-office dental insurance plan available for less than $9.00/month.